A planned hotel development near the Pitons in Saint Lucia has fueled more debate about the way to balance development with cultural and environmental concerns. The proposed “eco-luxury” development is “Freedom Bay”, which plans to include a five-star hotel in addition to private residences. 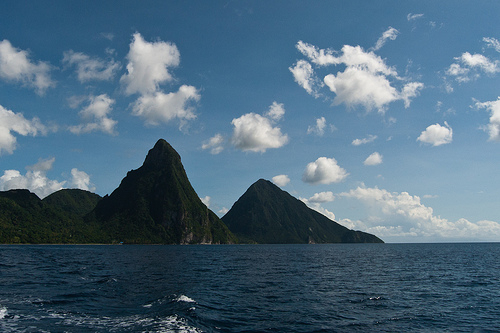 The Pitons, St.Lucia; image by alexbooker, used under a Creative Commons license. This is going to bring some jobs and that's great! St.Lucia can really do with more employment opportunities. I'm just curious as to how many of those jobs will be blue collar or white collar? Also on the topic of hotels have we sorted out the issues with some hotels not paying taxes for many years without consequences or are they using their employees jobs to not pay taxes owed to government. We also need to think about when if ever a government in St.Lucia will once and for all make it so that beaches belong to the people of St.Lucia and not the hotels? Plain and simple. 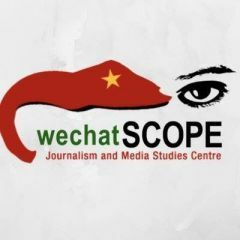 We have just handed over to foreign white speculators one of the most lucrative piece (sic) of real estate in the world. This project is no more than a luxury condo development and not a world established resort hotel. Therefore the positive impact on the economy will be minimum. I can tell you that that pierce (sic) of real estate will change hands and be sold for million (sic) more during the next 10 years. 6 senses are not hotel developers or investors, they are a hotel management company operating a few average resorts in the Indian Ocean…Due to transparency let the people of St.Lucia know what was paid for the property and the terms of contract, concessions etc. What use the poor excuses of Jobs? How much of our culture will we lose by losing access to that beach? You should demand to find out what kind of access you will have on that beach once construction starts. If you have never used that beach I hope you didn't just have an ‘its not in my backyard so it doesn't affect me’ thought! How much of our heritage will we lose? How much of our patrimony have we lost? Can we get it back? What can you do? I urge you to write to planning, ministers and the developers, call the talk shows and other media houses to let your voice be heard. What I would like to see is for this development to relocate to another area in St. Lucia outside of the PMA. GOSL acquire what was sold to the developer, develop what was deeded into a beach park and sell the rest of the land back to natural born St. Lucians giving first priority to people from Soufriere. AND a moratorium on SELLING any other piece of St. Lucia to foreigners, consider leasing land instead. 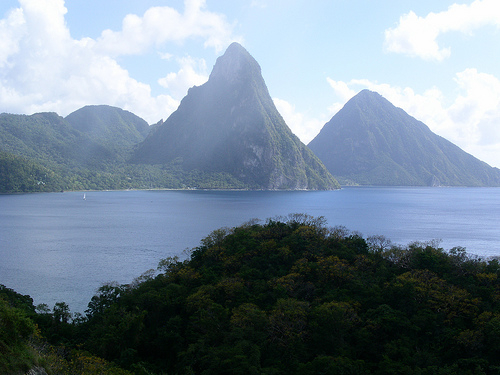 St Lucia – view of the Pitons from Anse Chastenet; image by heatheronhertravels, used under a CC license. The Freedom Bay Development falls within the Pitons Management Area. I believe what the Permanent Secretary said is that it falls within Policy Area 4 of the PMA. The Hyder Report or the Pitons Management Area and Soufriere Region Integrated Development Plan (November 2007) establishes 7 Policy Areas and prescribes the levels of development that should take place in each of these areas. Both these areas allow for trails and minor interpretation works. Policy Area 3 is the coastal area (Jalousie and Beausejour) and there are 3 different scenarios possible: (i) a restrained approach that calls for no new buildings or infrastructure. However, building refurbishment and minor leisure developments in hotel complex are allowed; (ii) a balanced or intermediate approach that allows leisure and residential developments in selected locations subject to EIA; and (iii) a Permissive Approach that allows leisure and residential developments subject to EIA. Policy Area 4 comprises the Remainder of the PMA, which is where the Freedom Bay project will be located. 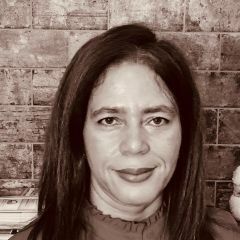 The Restrained Approach for this Area allows for built development and infrastructure only for limited community, residential and agricultural needs and minor leisure and tourism development and the processing of local agricultural produce. The balanced or intermediate approach for Policy Area 4 allows, in addition to the concessions for the Restrained Approach, development in or adjacent to existing villages or in plantations, e.g. plantation hotels, subject to EIA. The Permissive Approach for Policy Area 4 allows development in new locations subject to EIA. 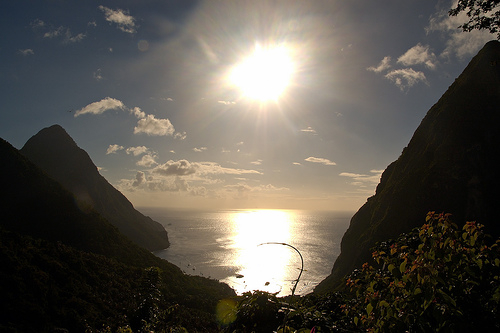 Setting Sun – St. Lucia – Pitons – View; image by Jason Michael, used under a CC license. The proposed concept and model is being offered by Sixth Senses and Freedom Bay can be done on a Conway site if done correctly. Let them build, let them build and responsibly, but let them build somewhere else on the island and preserve our Natural Heritage and Legacy. It is my view that lands of commercial and agriculture nature that is own (sic)by government should never be sold – only leased. Government should also move in and seek to acquire properties like this one and do a better job at sustain-ably managing it that (sic) this aging man. The thumbnail image used in this post is by Loimere, used under an Attribution 2.0 Generic Creative Commons license. Visit Loimere's flickr photostream. Concerned citizens of St Lucia should read: “Conference proceedings world heritage and tourism : managing the global and the local, June 2-4, 2010, Quebec City, Canada.” (Presses Université Laval, 2011). This report details the published opinion of UNESCO World Heritage affiliated organizations regarding the St Lucia PMA and threats of endangerment to this site. 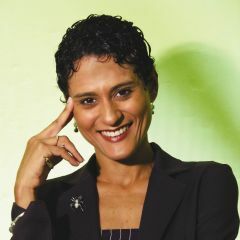 Link: http://books.google.com/books?id=phygkvvyFaEC&dq=st+lucia+national+trust+freedom+bay&source=gbs_navlinks_s. Click: ”preview this book”, scroll to p. 798; section entitled: “Interrogating the Universal in St Lucia’s Piton Management Area”. The development of Freedom Bay in Malgretoute, Soufriere is discussed in detail on p. 803. Public access to this sacred and historical site is critical to protection of the outstanding universal value of the PMA which refers to the iconic natural undeveloped beauty and the historical significance of the Pitons. In the case of Freedom Bay, the government promised to sell public property as well as purchased private property which was then sold to the developers. According to this report, these decisions by government to place public properties into private corporate ownership not only endanger the PMA but raise questions about St Lucia’s political and economic sovereignty. The UNESCO WHC did not approve the IDP approved by the St Lucia cabinet of ministers for the PMA in 2007, nor the decision by government to reconfigure the boundaries for the zone in which Freedom Bay would be built to accommodate their request to build in a no-build zone. St Lucia has been warned by the UNESCO World Heritage Committee in 2012 that the PMA will be inscribed on the list of endangered sites unless there is a moratorium on any new construction and a viable plan for conservation; it warns that the integrity of the universal value may have already been too damaged to remain a heritage site due to affluent resort development and privatization. Be advised that UNESCO World Heritage Committee has requested that St Lucia submit to the World Heritage Centre, by 1 February 2013, an updated report on the state of conservation of the property, focusing specifically on progress in halting existing development permits within the property and establishing an effective development control system, for examination by the World Heritage Committee at its 37th session in 2013, with a view to consider inscribing the property on the List of World Heritage in Danger if the measures requested by the Committee are not implemented.” Link: http://whc.unesco.org/en/decisions/4683. 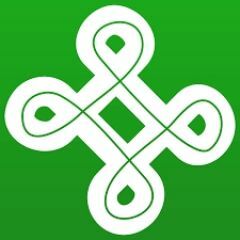 Please help St Lucians have a global voice. The Pitons are two volcanic plugs in a World Heritage Site in Saint Lucia And this is a Lovely place for Hotel Development. the concerned informations are provided in the site.